Last week was our introduction to both the language of coding and our little robot (BeeBot). We started the class by creating our programming journals where we will be able to draw our notes and ideas throughout the length of the session. We then talked about some words we would need to know for the class such as programmers, code, and commands. 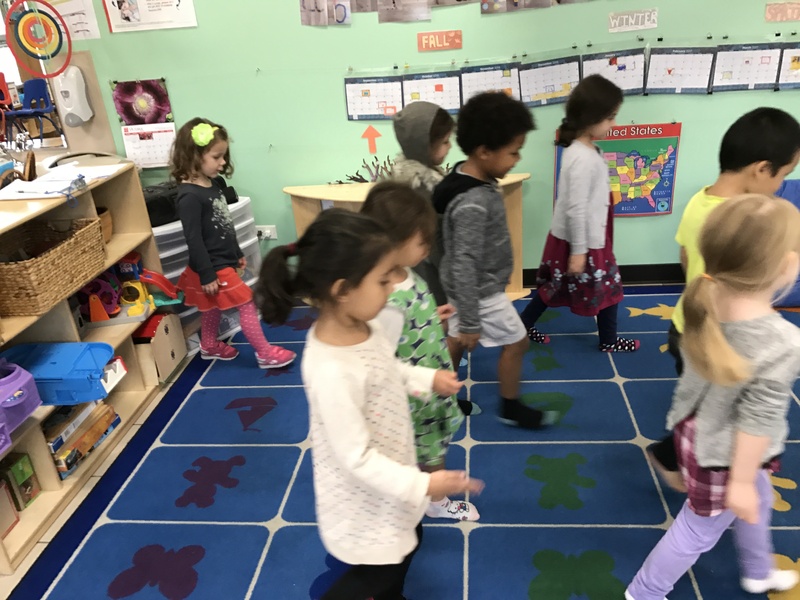 We learned that BeeBot can move forwards, backwards, make a left quarter turn, and make a right corner turn (and practiced moving in those directions). Everyone was then invited to try giving BeeBot 5 commands while the rest of the class then had to see if they could describe the sequence that the programmer asked BeeBot to do. This allowed the children the time to get their hands on BeeBot and become familiar with how he works. We were then ready for our first coding challenge! We had to figure out how many forward commands to give BeeBot so that he would move from the starting line to a wall of bricks. Well, before we could do that, we had to determine how far BeeBot moved with just one forward command! We decided to do that by using dominos to measure the distance traveled with one forward arrow and found out that 6 dominos laid side by side was the exact distance that BeeBot traveled with one command. We then had to decide how many commands to give the robot to travel the entire distance from the starting line to the end. To do that, we lined up dominos side to side across the entire distance. When we counted, we found we had 42 dominos. There was a bit of a discussion among the children on whether that meant that we needed 42 forward commands or not. I reminded them that we had learned that BeeBot travels the length of 6 dominos for one command and to use that information to solve our question. After a bit of thought, we decided to count the dominos in groups of 6 (turning up every 6th domino to help us remember); in the end we counted 7 groups of 6. We had to tell BeeBot to move forward 7 times! At first, after entering our 7 commands, BeeBot broke through the wall rather than stopping where we had hoped. We tried again and realized that BeeBot was making 8 moves instead of 7! We had forgotten to clear his programming before entering our new code. We refreshed his memory and re-entered our 7 commands; it worked! BeeBot traveled the distance we had planned. I then asked the group if we could figure out how to bring BeeBot back to the starting line and several children quickly shouted that we should tell him to move backwards 7 times! We entered the commands, and sure enough, BeeBot scooted backwards and ended up right at the start. I then challenged them to think about how BeeBot could get back with out having to move backwards. It took some consideration, but finally someone wondered if he could turn around. This gave us an opportunity to explore the quarter turn command. After a bit of experimenting, the children discovered that 2 left quarter turns would make BeeBot turn around and then we needed to also give him 7 forwards commands to send him back. What a great first class with our robot and coding fun!